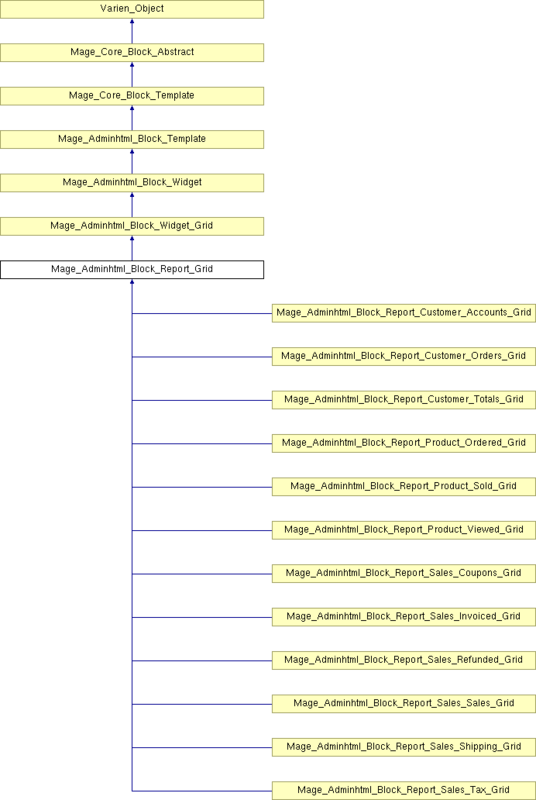 Reimplemented in Mage_Adminhtml_Block_Report_Customer_Accounts_Grid, Mage_Adminhtml_Block_Report_Customer_Orders_Grid, Mage_Adminhtml_Block_Report_Customer_Totals_Grid, Mage_Adminhtml_Block_Report_Product_Ordered_Grid, Mage_Adminhtml_Block_Report_Product_Sold_Grid, Mage_Adminhtml_Block_Report_Product_Viewed_Grid, Mage_Adminhtml_Block_Report_Sales_Coupons_Grid, Mage_Adminhtml_Block_Report_Sales_Invoiced_Grid, Mage_Adminhtml_Block_Report_Sales_Refunded_Grid, Mage_Adminhtml_Block_Report_Sales_Sales_Grid, Mage_Adminhtml_Block_Report_Sales_Shipping_Grid, and Mage_Adminhtml_Block_Report_Sales_Tax_Grid. Definition at line 63 of file Grid.php. Definition at line 103 of file Grid.php. Definition at line 94 of file Grid.php. Definition at line 73 of file Grid.php. Definition at line 177 of file Grid.php. Definition at line 341 of file Grid.php. Definition at line 371 of file Grid.php. Definition at line 543 of file Grid.php. Definition at line 414 of file Grid.php. Definition at line 579 of file Grid.php. Definition at line 232 of file Grid.php. Definition at line 282 of file Grid.php. Definition at line 538 of file Grid.php. Definition at line 569 of file Grid.php. Definition at line 471 of file Grid.php. Definition at line 252 of file Grid.php. Definition at line 302 of file Grid.php. Definition at line 396 of file Grid.php. Definition at line 326 of file Grid.php. Definition at line 277 of file Grid.php. Definition at line 404 of file Grid.php. Definition at line 558 of file Grid.php. Definition at line 290 of file Grid.php. Definition at line 357 of file Grid.php. Definition at line 212 of file Grid.php. Definition at line 202 of file Grid.php. Definition at line 316 of file Grid.php. Definition at line 528 of file Grid.php. Definition at line 272 of file Grid.php. Definition at line 533 of file Grid.php. Definition at line 222 of file Grid.php. Definition at line 242 of file Grid.php. Definition at line 295 of file Grid.php. Definition at line 192 of file Grid.php. Definition at line 311 of file Grid.php. Definition at line 262 of file Grid.php. Definition at line 38 of file Grid.php. Definition at line 46 of file Grid.php. Definition at line 56 of file Grid.php. Definition at line 52 of file Grid.php. Definition at line 42 of file Grid.php.